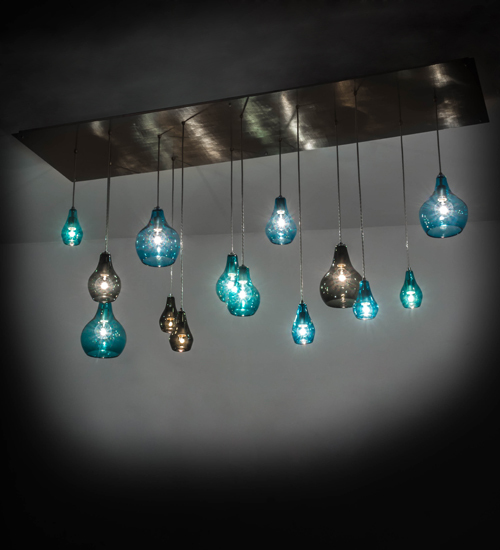 Description: Stunning graceful and elegant pear shaped art glass forms are transformed into a masterpiece of cascading blown-glass pendant shades in Light Blue, Dark Blue and Gray. The colorful diffusers are suspended by aircraft cables attached to a large rectangular canopy featured in a contemporary Brushed Champagne finish. This fixture is available in custom designs, sizes, colors and dimmable energy efficient lamping options such as LED. UL and cUL listed for damp and dry locations.